Quality Handsewn 13 month calendar pad. Advertisers include insurance companies, banks, small retail establishments, trucking companies, pharmacies, andmany more. • Assorted (only) radiant backgrounds highlighting the jet black imprint. • Removable adhesive back for easy-off replacement each year. 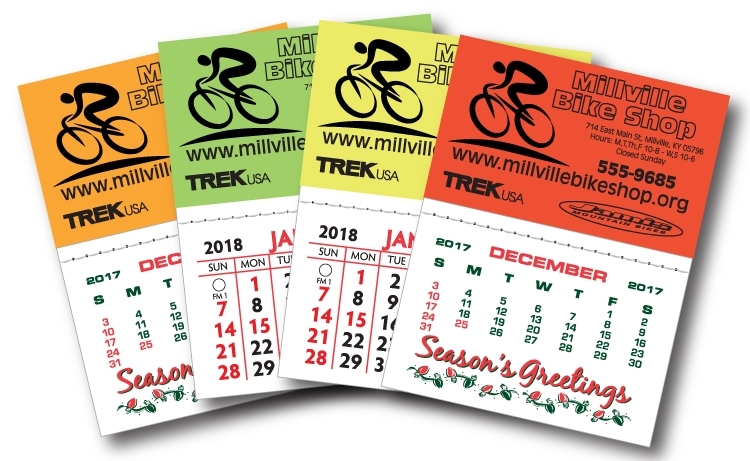 • Quality Hand Sewn Calendar Pads. 250 qty.=13 lbs/ 1,000 qty= 50 lbs. • Available only in assorted neon colors with black imprint only. Order in increments of 250 only. Priced each with black imprint on neon backing. NOTE: Must be ordered in increments of 250.